In the 90s, those star-shaped rubber bands came out and everyone thought, "Ah! I know! I'll do that thing where I weave a star out of a rubber band, but I'll do it with one of these. And then it will seem like the band magically became the star shape!" It's a pretty obvious idea. But what it lacks in originality it makes up for in simplicity and the fact that people seem to enjoy the trick. And it makes for a mildly cool souvenir. I used to do this so much that one time, at a party, two women I had performed it for bumped into each other. They both had their star band on their wrist. Apparently it bummed them out. They had thought they were special. They were special. But me making them a star rubber band wasn't evidence of that. It's also an ideal way to distract a kid who's spazzing out on a plane or something. I don't have a ton of stuff in my repertoire that's as good for kids as adults, but this is one of those things. I don't consider this some mind-bending miracle. But it's always something I thought was fun to perform in low-key situations. And I have a couple of things to add to the effect that may interest some of you. One is a way to bring in both rubber bands in a manner that makes it seem like both have been examined. The other is the story that goes along with it. It's just a dumb little spiel, but it affords me the opportunity to do my favorite style of presentation where I get to act like an idiot and brag about something stupid. I'll start with the presentation first then give you details on the move I use to allow them to seemingly see both rubber bands as normal. I have two rubber bands on my wrist (just two). Occasionally someone would ask me what they were there for. "Oh, I do rubberbandigami," I'd say quickly, like it was a thing, while keeping my attention on the tv or my drink or whatever. "Rubberbandigami," I'd say again. Then I'd turn my attention to them completely. "Wait... do you not know about rubberbandigami? Oh my god... you don't pay any attention to the world around you, do you? Rubberbandigami is like, sweeping the country. Well, the world, actually. Everyone is doing it." I then rattle off a few celebrities. The first one is already dated and it only gets worse from there. "Yeah, everyone. Jamie Lynn Spears. 'Blanket' Jackson. Jonathan Lipnicki. 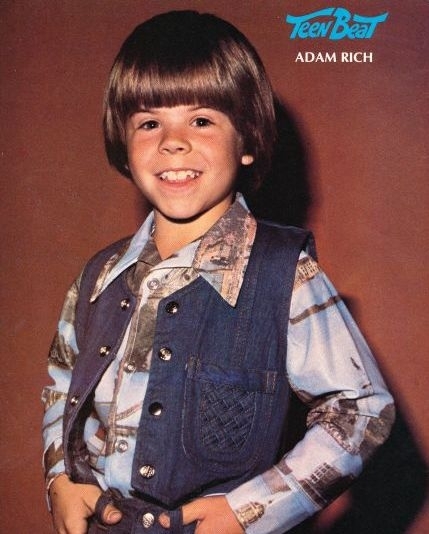 Adam Rich." 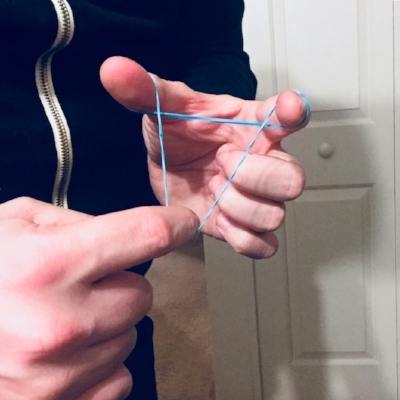 I pull one of the rubber bands off my wrist and toss it on the table. "Take a look. It looks like a regular rubber band, yeah? That's because it is. But rubberbandigami is about doing something extraordinary with them. It's about twisting and weaving them into photo-realistic representations of other items. I'm not bragging, but I'm pretty good at it." I then demonstrate some rubberbandigami for them. "You can do it with multiple rubber bands too. Which actually makes it easier because there's more material to work with." I pull the second band off my wrist and hand it to the person. "It just uses normal rubber bands that you can get at Staples or wherever." "There's a ranking system. It's like karate with their belts. Except here the ranking is based on stars. Once you progress your way through the star system, and learn how to construct each star, you're considered a master rubberbandigamist. That's where I am." "I'll show you. Here's level one. Two rubber bands. Two hands. One star." "Next is level two. That's two rubber bands. Two hands. Two stars." "Level three is much more difficult because it uses one less rubber band. Can you hold this one in your fist for me? I'll show you something cool with that in a minute. Level three is one rubber band. One hand. One star. There are about three dozen people in the world who have reached this level. That looks like this...."
"Finally," I say, "is level four. Six people have attained level four status. Level four is: One rubber band. One star. NO hands. Let's see if I can get this." I toss the band in my hands aside and breathe deeply a few times and then catch my breath and hold it, then let it out after a few moments. "I think I got it," I say. "Open up your hand." She does and finds a rubber band in a permanent star shape. You can find instructions for the different star shapes on youtube, I'm not going to go through that here. 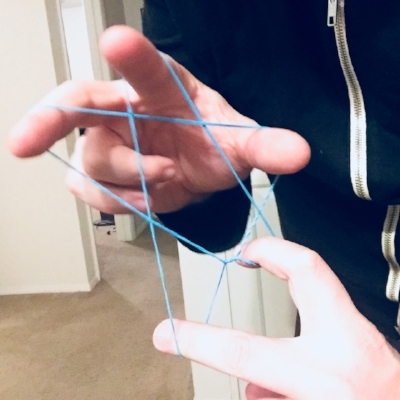 I will describe the one move in the routine which is something I came up with myself, but I don't have much background in rubber band magic and it certainly could be part of the literature and I'll happily give credit if someone can provide it. So I have two rubber bands on my left wrist (more than two makes the upcoming move less clean). One of the bands is a star band. I take off the normal band and hand it to the spectator to look at. I take it back and then make a few shapes with it on my left hand. When I'm done I leave it wrapped around my left hand at the base of my fingers. I then say, "You can add another rubber band too." And grab and pull up on the star band on my wrist with my middle finger and ring finger of my right hand. 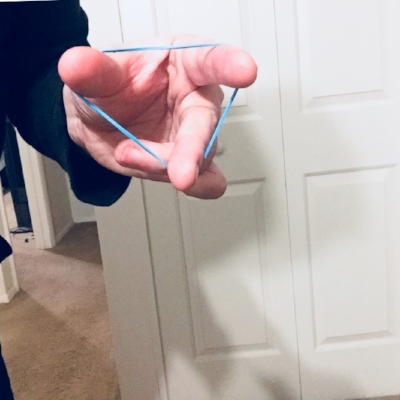 I start pulling that band off my wrist and as I'm passing the band on my fingers, I pinch that band between the forefinger and thumb of my right hand and drop the other band off my right-hand fingers, leaving it in place of the original band that was wrapped around my left palm. Here's what it looks like in motion. To say this happens on the offbeat is an understatement. It happens before anyone even knows a trick is going to happen. So there is no heat on the move at all. Here it is with different colored bands so the switch is clearer. And here's a kind of slowed down version from behind.